Proprietary Name: Ceftriaxone Sodium What is the Proprietary Name? Non-Proprietary Name: Ceftriaxone Sodium What is the Non-Proprietary Name? Ceftriaxone Sodium with NDC 70518-1893 is a a human prescription drug product labeled by Remedyrepack Inc.. The generic name of Ceftriaxone Sodium is ceftriaxone sodium. The product's dosage form is injection, powder, for solution and is administered via intramuscular; intravenous form. FDA Application Number: ANDA065169 What is the FDA Application Number? Rx OnlyTo reduce the development of drug-resistant bacteria and maintain the effectiveness of ceftriaxone for injection, and other antibacterial drugs, ceftriaxone for injection should be used only to treat or prevent infections that are proven or strongly suspected to be caused by bacteria. ® is a registered trademark of G.D. Searle & Co.
Ceftriaxone sodium is a white to yellowish crystalline powder which is readily soluble in water, sparingly soluble in methanol and very slightly soluble in ethanol. The pH of a 1% aqueous solution is approximately 6.7. The color of ceftriaxone sodium solutions ranges from light yellow to amber, depending on the length of storage, concentration and diluent used. Each vial contains ceftriaxone sodium equivalent to 250 mg, 500 mg, 1 gram or 2 grams of ceftriaxone activity. Ceftriaxone sodium contains approximately 83 mg (3.6 mEq) of sodium per gram of ceftriaxone activity. Table 4); therefore, dosage adjustments are not necessary for these patients with ceftriaxone dosages up to 2 g per day. Ceftriaxone was not removed to any significant extent from the plasma by hemodialysis; in six of 26 dialysis patients, the elimination rate of ceftriaxone was markedly reduced. Creatinine clearance.14.70.6513.7 Severe (5 to 15 mL/min)15.70.5612.5 Moderate (16 to 30 mL/min)11.40.7211.8 Mild (31 to 60 mL/min)12.40.7013.3Patients WithLiver Disease 8.81.113.6The elimination of ceftriaxone is not altered when ceftriaxone is co-administered with probenecid. In one study, total ceftriaxone concentrations (bound and unbound) were measured in middle ear fluid obtained during the insertion of tympanostomy tubes in 42 pediatric patients with otitis media. Sampling times were from 1 to 50 hours after a single intramuscular injection of 50 mg/kg of ceftriaxone. Mean (±SD) ceftriaxone levels in the middle ear reached a peak of 35 (±12) mcg/mL at 24 hours, and remained at 19 (±7) mcg/mL at 48 hours. Based on middle ear fluid ceftriaxone concentrations in the 23 to 25 hour and the 46 to 50 hour sampling time intervals, a half-life of 25 hours was calculated. Ceftriaxone is highly bound to plasma proteins. The extent of binding to proteins in the middle ear fluid is unknown. in vivo following administration of 2 grams ceftriaxone infused over 30 minutes) were used in combination with calcium concentrations up to 12 mM (48 mg/dL). Recovery of ceftriaxone from plasma was reduced with calcium concentrations of 6 mM (24 mg/dL) or higher in adult plasma or 4 mM (16 mg/dL) or higher in neonatal plasma. This may be reflective of ceftriaxone-calcium precipitation. in vitro study antagonistic effects have been observed with the combination of chloramphenicol and ceftriaxone. Has not been established in adequate and well-controlled clinical trials. in vitro susceptibility test results for antimicrobial drug products used in resident hospitals to the physician as periodic reports that describe the susceptibility profile of nosocomial and community-acquired pathogens. These reports should aid the physician in selecting an antibacterial drug product for treatment. Dilution techniquesQuantitative methods are used to determine antimicrobial minimal inhibitory concentrations (MICs). These MICs provide estimates of the susceptibility of bacteria to antimicrobial compounds. The MICs should be determined using a standardized test method. 1,3 The MIC values should be interpreted according to criteria provided in Table 5. Diffusion techniquesQuantitative methods that require measurement of zone diameters also provide reproducible estimates of the susceptibility of bacteria to antimicrobial compounds. The zone size provides an estimate of the susceptibility of bacteria to antimicrobial compounds. The zone size should be determined using a standardized test method. Anaerobic techniquesFor anaerobic bacteria, the susceptibility to ceftriaxone as MICs can be determined by a standardized agar test method. Enterobacteriaceae are based on a dose of 1 gram IV q 24h. For isolates with intermediate susceptibility, use a dose of 2 grams IV q 24h in patients with normal renal function. Haemophilus influenzae, susceptibility interpretive criteria are based on a dose of 2 grams IV every 24 hours in patients with normal renal function. >20 mm are susceptible (MIC ≤ 0.06 mcg/mL) to penicillin and can be considered susceptible to ceftriaxone. Streptococcus pneumoniae isolates should not be reported as penicillin (ceftriaxone) resistant or intermediate based solely on an oxacillin zone diameter of ≤ 19 mm. The ceftriaxone MIC should be determined for those isolates with oxacillin zone diameters ≤ 19 mm. Resistant indicates that the antimicrobial drug is not likely to inhibit growth of the pathogen if the antimicrobial drug reaches the concentrations usually achievable at the infection site; other therapy should be selected. Quality ControlStandardized susceptibility test procedures require the use of laboratory controls to monitor and ensure the accuracy and precision of supplies and reagents used in the assay, and the techniques of the individual performing the test. Table 6 should be achieved. Moraxella catarrhalis (including beta-lactamase producing strains). Chlamydia trachomatis is one of the suspected pathogens, appropriate antichlamydial coverage should be added. The preoperative administration of a single 1 g dose of ceftriaxone may reduce the incidence of postoperative infections in patients undergoing surgical procedures classified as contaminated or potentially contaminated (e.g., vaginal or abdominal hysterectomy or cholecystectomy for chronic calculous cholecystitis in high-risk patients, such as those over 70 years of age, with acute cholecystitis not requiring therapeutic antimicrobials, obstructive jaundice or common duct bile stones) and in surgical patients for whom infection at the operative site would present serious risk (e.g., during coronary artery bypass surgery). Although ceftriaxone has been shown to have been as effective as cefazolin in the prevention of infection following coronary artery bypass surgery, no placebo-controlled trials have been conducted to evaluate any cephalosporin antibiotic in the prevention of infection following coronary artery bypass surgery.When administered prior to surgical procedures for which it is indicated, a single 1 g dose of ceftriaxone provides protection from most infections due to susceptible organisms throughout the course of the procedure. Rash (1.7%). Less frequently reported (<1%) were pruritus, fever or chills. Premature neonates: Ceftriaxone for injection is contraindicated in premature neonates up to a postmenstrual age of 41 weeks (gestational age + chronological age). Hyperbilirubinemic neonates: Hyperbilirubinemic neonates should not be treated with ceftriaxone for injection. Ceftriaxone can displace bilirubin from its binding to serum albumin, leading to a risk of bilirubin encephalopathy in these patients. Cases of fatal outcomes in which a crystalline material was observed in the lungs and kidneys at autopsy have been reported in neonates receiving ceftriaxone for injection and calcium-containing fluids.In some of these cases, the same intravenous infusion line was used for both ceftriaxone for injection and calcium-containing fluids and in some a precipitate was observed in the intravenous infusion line. There have been no similar reports in patients other than neonates. Before therapy with ceftriaxone for injection is instituted, careful inquiry should be made to determine whether the patient has had previous hypersensitivity reactions to cephalosporins, penicillins and other beta-lactam agents or other drugs. This product should be given cautiously to penicillin and other beta-lactam agent-sensitive patients. Antibacterial drugs should be administered with caution to any patient who has demonstrated some form of allergy, particularly to drugs. Serious acute hypersensitivity reactions may require the use of subcutaneous epinephrine and other emergency measures.As with all beta-lactam antibacterial agents, serious and occasionally fatal hypersensitivity reactions (i.e., anaphylaxis) have been reported. In case of severe hypersensitivity reactions, treatment with ceftriaxone must be discontinued immediately and adequate emergency measures must be initiated. Do not use diluents containing calcium, such as Ringer’s solution or Hartmann’s solution, to reconstitute ceftriaxone vials or to further dilute a reconstituted vial for IV administration because a precipitate can form. Precipitation of ceftriaxone-calcium can also occur when ceftriaxone is mixed with calcium-containing solutions in the same IV administration line. Ceftriaxone must not be administered simultaneously with calcium-containing IV solutions, including continuous calcium-containing infusions such as parenteral nutrition via a Y-site. However, in patients other than neonates, ceftriaxone and calcium-containing solutions may be administered sequentially of one another if the infusion lines are thoroughly flushed between infusions with a compatible fluid. C. difficile cause increased morbidity and mortality, as these infections can be refractory to antimicrobial therapy and may require colectomy. CDAD must be considered in all patients who present with diarrhea following antibiotic use. Careful medical history is necessary since CDAD has been reported to occur over two months after the administration of antibacterial agents. An immune mediated hemolytic anemia has been observed in patients receiving cephalosporin class antibacterials including ceftriaxone. Severe cases of hemolytic anemia, including fatalities, have been reported during treatment in both adults and children. If a patient develops anemia while on ceftriaxone, the diagnosis of a cephalosporin associated anemia should be considered and ceftriaxone stopped until the etiology is determined. Clinical Pharmacology). Therefore, patients with renal failure normally require no adjustment in dosage when usual doses of ceftriaxone are administered. Gallbladder PseudolithiasisCeftriaxone-calcium precipitates in the gallbladder have been observed in patients receiving ceftriaxone. These precipitates appear on sonography as an echo without acoustical shadowing suggesting sludge or as an echo with acoustical shadowing which may be misinterpreted as gallstones. The probability of such precipitates appears to be greatest in pediatric patients. Patients may be asymptomatic or may develop symptoms of gallbladder disease. The condition appears to be reversible upon discontinuation of ceftriaxone sodium and institution of conservative management. Discontinue ceftriaxone sodium in patients who develop signs and symptoms suggestive of gallbladder disease and/or the sonographic findings described above.Urolithiasis and Post-Renal Acute Renal FailureCeftriaxone-calcium precipitates in the urinary tract have been observed in patients receiving ceftriaxone and may be detected as sonographic abnormalities. The probability of such precipitates appears to be greatest in pediatric patients. Patients may be asymptomatic or may develop symptoms of urolithiasis, and ureteral obstruction and post-renal acute renal failure. The condition appears to be reversible upon discontinuation of ceftriaxone sodium and institution of appropriate management. Ensure adequate hydration in patients receiving ceftriaxone. Discontinue ceftriaxone in patients who develop signs and symptoms suggestive of urolithiasis, oliguria or renal failure and/or the sonographic findings described above.PancreatitisCases of pancreatitis, possibly secondary to biliary obstruction, have been reported in patients treated with ceftriaxone. Most patients presented with risk factors for biliary stasis and biliary sludge (preceding major therapy, severe illness, total parenteral nutrition). A cofactor role of ceftriaxone-related biliary precipitation cannot be ruled out. Patients should be counseled that antibacterial drugs including ceftriaxone for injection should only be used to treat bacterial infections. They do not treat viral infections (e.g., common cold). When ceftriaxone for injection is prescribed to treat a bacterial infection, patients should be told that although it is common to feel better early in the course of therapy, the medication should be taken exactly as directed. Skipping doses or not completing the full course of therapy may (1) decrease the effectiveness of the immediate treatment and (2) increase the likelihood that bacteria will develop resistance and will not be treatable by ceftriaxone for injection or other antibacterial drugs in the future. in vitro with ceftriaxone. Ceftriaxone showed no potential for mutagenic activity in these studies. 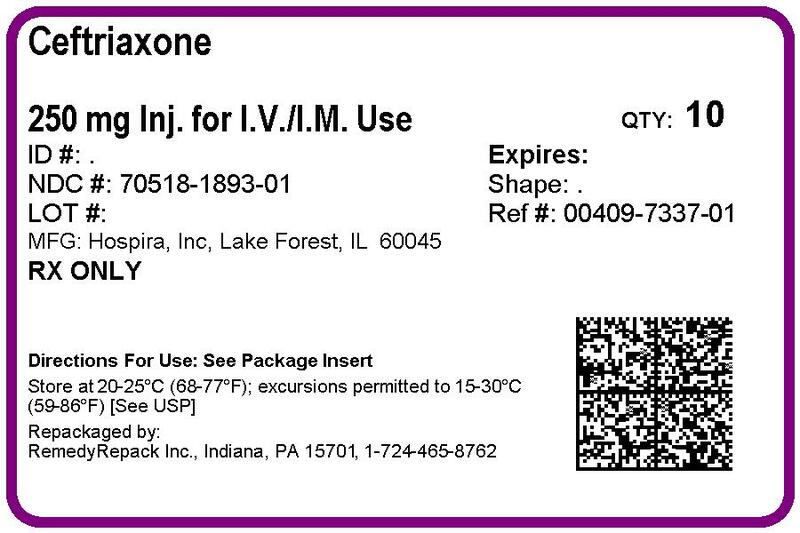 Ceftriaxone produced no impairment of fertility when given intravenously to rats at daily doses up to 586 mg/kg/day, approximately 20 times the recommended clinical dose of 2 g/day. Reproductive studies have been performed in mice and rats at doses up to 20 times the usual human dose and have no evidence of embryotoxicity, fetotoxicity or teratogenicity. In primates, no embryotoxicity or teratogenicity was demonstrated at a dose approximately 3 times the human dose.There are, however, no adequate and well-controlled studies in pregnant women. Because animal reproductive studies are not always predictive of human response, this drug should be used during pregnancy only if clearly needed. In patients treated with ceftriaxone the Coombs’ test may become positive. Ceftriaxone for injection, like other antibacterial drugs, may result in positive test results for galactosemia.Nonenzymatic methods for the glucose determination in urine may give false-positive results. For this reason, urine-glucose determination during therapy with ceftriaxone should be done enzymatically.The presence of ceftriaxone may falsely lower estimated blood glucose values obtained with some blood glucose monitoring systems. Please refer to instructions for use for each system. Alternative testing methods should be used if necessary. Allergic reactions, drug fever, serum sickness-like reaction, renal dysfunction, toxic nephropathy, reversible hyperactivity, hypertonia, hepatic dysfunction including cholestasis, aplastic anemia, hemorrhage, and superinfection. Pain, induration and tenderness was 1% overall. Phlebitis was reported in <1% after IV administration. The incidence of warmth, tightness or induration was 17% (3/17) after IM administration of 350 mg/mL and 5% (1/20) after IM administration of 250 mg/mL. Eosinophilia (6%), thrombocytosis (5.1%) and leukopenia (2.1%). Less frequently reported (<1%) were anemia, hemolytic anemia, neutropenia, lymphopenia, thrombocytopenia and prolongation of the prothrombin time. Elevations of aspartate aminotransferase (AST) (3.1%) or alanine aminotransferase (ALT) (3.3%). Less frequently reported (<1%) were elevations of alkaline phosphatase and bilirubin. Elevations of the BUN (1.2%). Less frequently reported (<1%) were elevations of creatinine and the presence of casts in the urine. Headache or dizziness were reported occasionally (<1%). Moniliasis or vaginitis were reported occasionally (<1%). Oliguria, ureteric obstruction, post-renal acute renal failure. Diaphoresis and flushing were reported occasionally (<1%). Blood creatinine increased (0.6%).Other rarely observed adverse reactions (<0.1%) include abdominal pain, agranulocytosis, allergic pneumonitis, anaphylaxis, basophilia, biliary lithiasis, bronchospasm, colitis, dyspepsia, epistaxis, flatulence, gallbladder sludge, glycosuria, hematuria, jaundice, leukocytosis, lymphocytosis, monocytosis, nephrolithiasis, palpitations, a decrease in the prothrombin time, renal precipitations, seizures, and serum sickness. In addition to the adverse reactions reported during clinical trials, the following adverse experiences have been reported during clinical practice in patients treated with ceftriaxone. Data are generally insufficient to allow an estimate of incidence or to establish causation. A small number of cases of fatal outcomes in which a crystalline material was observed in the lungs and kidneys at autopsy have been reported in neonates receiving ceftriaxone and calcium-containing fluids. In some of these cases, the same intravenous infusion line was used for both ceftriaxone and calcium-containing fluids and in some a precipitate was observed in the intravenous infusion line. At least one fatality has been reported in a neonate in whom ceftriaxone and calcium-containing fluids were administered at different time points via different intravenous lines; no crystalline material was observed at autopsy in this neonate. There have been no similar reports in patients other than neonates. Exanthema, allergic dermatitis, urticaria, edema; acute generalized exanthematous pustulosis (AGEP) and isolated cases of severe cutaneous adverse reactions (erythema multiforme, Stevens-Johnson syndrome or Lyell’s syndrome/toxic epidermal necrolysis) have been reported. 3) have been reported, most of them after 10 days of treatment and following total doses of 20 g or more. Symptomatic precipitation of ceftriaxone calcium salt in the gallbladder, kernicterus, oliguria, and anaphylactic or anaphylactoid reactions. Dosage and Administration). If seizures associated with drug therapy occur, the drug should be discontinued. Anticonvulsant therapy can be given if clinically indicated. For the treatment of serious miscellaneous infections other than meningitis, the recommended total daily dose is 50 to 75 mg/kg, given in divided doses every 12 hours. The total daily dose should not exceed 2 grams.In the treatment of meningitis, it is recommended that the initial therapeutic dose be 100 mg/kg (not to exceed 4 grams). Thereafter, a total daily dose of 100 mg/kg/day (not to exceed 4 grams daily) is recommended. The daily dose may be administered once a day (or in equally divided doses every 12 hours). The usual duration of therapy is 7 to 14 days. Chlamydia trachomatis is a suspected pathogen, appropriate antichlamydial coverage should be added, because ceftriaxone sodium has no activity against this organism. Streptococcus pyogenes, therapy should be continued for at least 10 days. Dosage and Administration: Compatibility and Stability). Inject diluent into vial, shake vial thoroughly to form solution. Withdraw entire contents of vial into syringe to equal total labeled dose.After reconstitution, each 1 mL of solution contains approximately 250 mg or 350 mg equivalent of ceftriaxone according to the amount of diluent indicated below. If required, more dilute solutions could be utilized. Vial Dosage SizeAmount of Diluent to be Added250 mg 2.4 mL500 mg 4.8 mL1 g9.6 mL2 g19.2 mLAfter reconstitution, each 1 mL of solution contains approximately 100 mg equivalent of ceftriaxone. Withdraw entire contents and dilute to the desired concentration with the appropriate IV diluent. intravenous ceftriaxone solutions are stable at room temperature (25°C) for 24 hours, at concentrations between 10 mg/mL and 40 mg/mL: Sodium Lactate (PVC container), 10% Invert Sugar (glass container), 5% Sodium Bicarbonate (glass container), Freamine III (glass container), Normosol-M in 5% Dextrose (glass and PVC containers), Ionosol-B in 5% Dextrose (glass container), 5% Mannitol (glass container), 10% Mannitol (glass container). After the indicated stability time periods, unused portions of solutions should be discarded.NOTE: Parenteral drug products should be inspected visually for particulate matter before administration.Ceftriaxone reconstituted with 5% Dextrose or 0.9% Sodium Chloride solution at concentrations between 10 mg/mL and 40 mg/mL, and then stored in frozen state (-20°C) in PVC or polyolefin containers, remains stable for 26 weeks.Frozen solutions of ceftriaxone for injection should be thawed at room temperature before use. After thawing, unused portions should be discarded. Concretions consisting of the precipitated calcium salt of ceftriaxone have been found in the gallbladder bile of dogs and baboons treated with ceftriaxone.These appeared as a gritty sediment in dogs that received 100 mg/kg/day for 4 weeks. A similar phenomenon has been observed in baboons but only after a protracted dosing period (6 months) at higher dose levels (335 mg/kg/day or more). The likelihood of this occurrence in humans is considered to be low, since ceftriaxone has a greater plasma half-life in humans, the calcium salt of ceftriaxone is more soluble in human gallbladder bile and the calcium content of human gallbladder bile is relatively low. Ceftriaxone for injection, USP is supplied as a sterile crystalline powder in glass vials. The following packages are available:Vials containing 250 mg equivalent to ceftriaxone. Package of 10 (0409-7337-01).Vials containing 500 mg equivalent to ceftriaxone. Package of 10 (0409-7338-01).Vials containing 1 g equivalent to ceftriaxone. Package of 10 (0409-7332-01).Vials containing 2 g equivalent to ceftriaxone. Package of 10 (0409-7335-03). Methods for Dilution Antimicrobial Susceptibility Tests for Bacteria that Grow Aerobically; Approved Standard - Tenth Edition. CLSI document M07-A10, Clinical and Laboratory Standards Institute, 950 West Valley Road, Suite 2500, Wayne, Pennsylvania 19087, USA, 2015. Performance Standards for Antimicrobial Susceptibility Testing; Twenty-fifth Informational Supplement, CLSI document M100-S25, Clinical and Laboratory Standards Institute, 950 West Valley Road, Suite 2500, Wayne, Pennsylvania 19087, USA, 2015. Performance Standards for Antimicrobial Disk Diffusion Susceptibility Tests; Approved Standard – Twelfth Edition CLSI document M02-A12, Clinical and Laboratory Standards Institute, 950 West Valley Road, Suite 2500, Wayne, Pennsylvania 19087, USA, 2015. Methods for Antimicrobial Susceptibility Testing of Anaerobic Bacteria; Approved Standard - Eighth Edition. CLSI document M11-A8. Clinical and Laboratory Standards Institute, 950 West Valley Road, Suite 2500, Wayne, PA 19087 USA, 2012. Barnett ED, Teele DW, Klein JO, et al. Comparison of Ceftriaxone and Trimethoprim-Sulfamethoxazole for Acute Otitis Media. Pediatrics. Vol. 99, No. 1, January 1997.